Panjeeri brings back memories of my grandmother who used to make panjeeri with almost every grain. She used to make panjeeri even with rice flour as one of the ingredients and would sometimes bind the mix into laddu for the ease of handling and serving. Panjeeri is a roasted mix of flours, chopped nuts, powdered fox nuts and raisins, the ingredients are roasted separately and slowly along with ghee and are mixed with raw sugar or jaggery powder to make a delicious mix that is considered great for breakfast or for day time snacking. My grandmother used to have panjeeri with warm milk too, just like one has cereal. Many old people like to add panjeeri to milk as they find it easy to gulp down that way. Panjeeri mixed with mashed banana and some milk makes good baby food too, but for that purpose panjeeri is made without ghee and nuts. How versatile a recipe can be. The panjeeri mix includes dry ginger, turmeric, edible gum etc if it is made for winters and is made without these for summer days. But panjeeri is not an everyday summer food traditionally, it was made when one had to stock some ready to eat options at home or for traveling. I remember panjeeri used to be our travel food each summer vacation. My mother still makes it almost all through the year using different ingredients suited for seasons, she makes a sugar free (not with sugar substitutes) version with few raisins and chopped dates for my dad too who is a diabetic. Like all diabetics my dad loves sweets and feels deprived if he doesn't get such things. This time I made this panjeeri with mixed millets flour. There is some pearl millet, some sorghum, some amaranth flour, some corn meal, some barley flour, some oats flour, little wheat flour, some bran and some whole chickpea flour (with skin) in this mix. One can always mix the flours according to taste and preference and make the panjeeri using any of these flours alone, but mixing the flours works great for a complex flavour. The panjeeri was actually made in large amount this time. I am doing a workshop on health benefits of millets and their everyday uses and wanted the participants get a taste of what they learn that day. I am so looking forward to the workshop. mixed millet flour 1 kilo (I used a mix of sorghum (jowar), pearl millet (bajra), barley (jau), corn (makii), oats (jaee), amatranth (ramdana or rajgira), whole wheat, whole black chickpea (kala chana) and little bran. All flours are added in equal amount. *skip using wheat if you are allergic to it. I get this flour mix for my rotis and used the same for making panjeeri, skipping wheat makes no difference in taste. Gluten free version of panjeeri is as good. ** skip sugar or jaggery for diabetics. Ad some stewia powder or just some chopped dates too and serve in small portions to diabetics. Heat 50 gm ghee in a pan ( I used a thick base kadhai) and roast the fox nut powder lightly. Keep aside. Heat a little more ghee and fry the chopped almonds lightly on low flame, add the raisins in the last couple of minutes, fry together and take out from the kadhai. Keep aside. 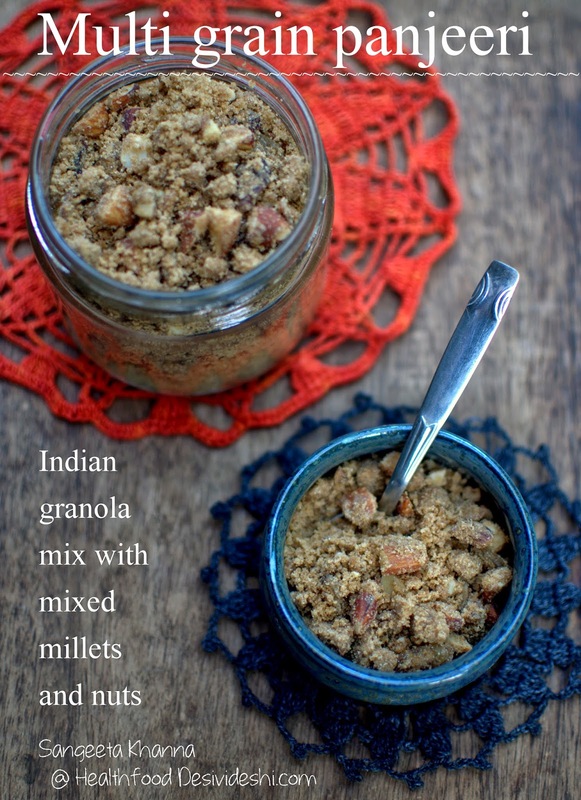 Heat the remaining ghee and tip in the mixed millet flour and the flax seeds meal. Roast the flour mix at very low flame for an hour or so or till it becomes a bit brown and gets aromatic too. Take off the stove, add the raw sugar or jaggery powder, the roasted fox nut nut powder and almonds and raisins too and mix well. A 25-30 gm serving of this multigrain panjeeri is very filling with a glass of milk. Some people even eat 50 gm or more but it is one of the healthier low glycemic foods that keep you full for hours. The next meal is automatically portion controlled if you have had this panjeeri in a large serving. 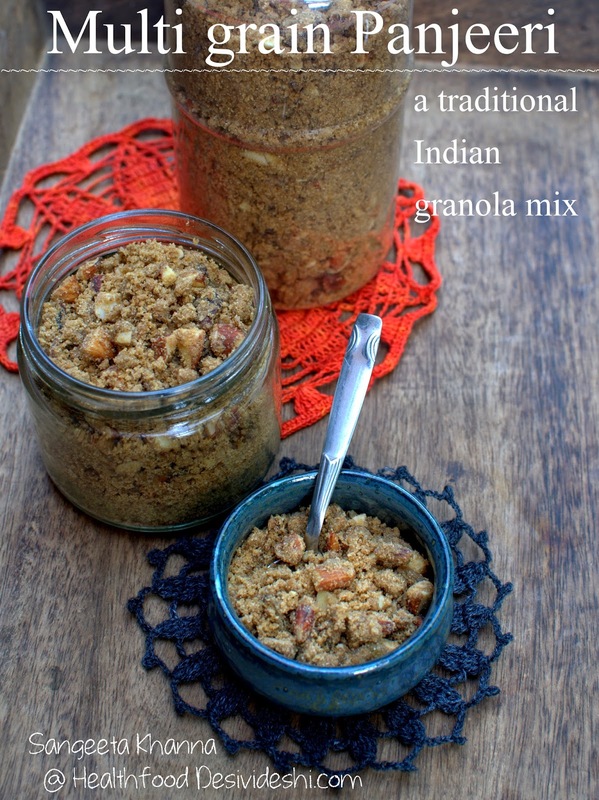 I always call it desi granola mix as it has everything a granola has and is made with local ingredients. And it can also be modified to suit seasons. I make a methi panjeeri a lot for myself and the recipe is still to be shared, will share that too very soon. Another version of panjeeri with herbs and nuts is made for new mothers too which is a ritual in most Indian homes. Are you based in Hyderabad? 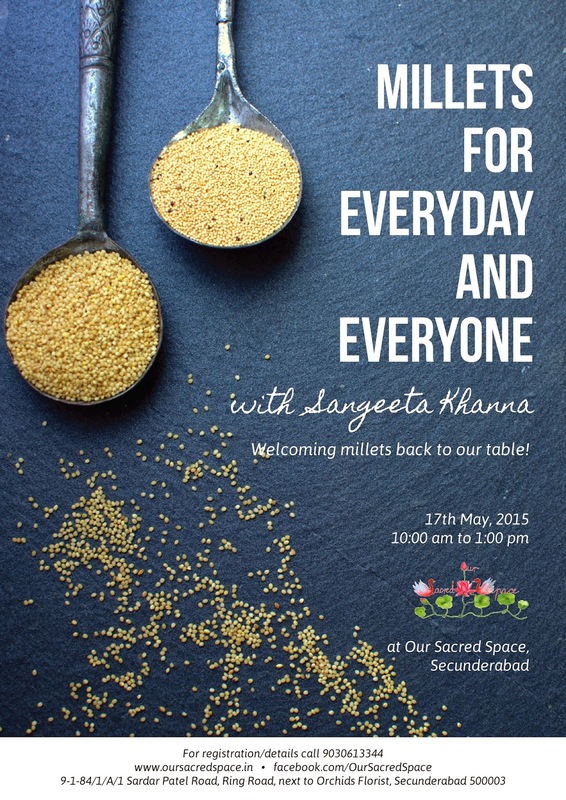 Come for this workshop if so and enjoy some millet panjeeri with me. There will be some more food to sample and I am sure you all would enjoy being there, we will definitely learn some interesting things that day. Looking forward to talk about millets, their health benefits and how millets are crucial for the health of our planet as well. Come join me there. I will be sharing the updates and may be videos of the workshop too with all of you here. Stay tuned. Panjeeri is a wonder food as per me...it's a fuss free b'fast warm glass of milk & katori full of panjeeri :) Love your version I'm gonna try your version with multigrains....sangeeta how do u make makahne ka powder...does it work out in regular mixie..